Norse adventure is on offer in Böb: The Epic Viking Quest for the Sword of Tullemutt. Created by Net Entertainment and exclusively produced for ComeOn Casino, it’s a 5 reel, 25 payline game that comes with a pick me round where prizes of over 400 times your stake are on offer as well as a free spins feature where all payouts are trebled. Join Böb on his quest from between 25p and £50 per spin. Böb has a suitably epic feel as far as sound and visuals are concerned – with a stirring, orchestral soundtrack thumping away in the background, the reels feature lower value playing cards as well as shields, swords and Viking helmets. They’re joined by a golden wild that replaces all symbols bar the bonus and free spins. Landing 2, 3, 4 or 5 of these wilds results in a payout of 5, 200, 2,000 or 7,500 coins. Böb comes with a pair of bonus features – land 3 or more of Böb the Viking warrior symbol on successive reels from left to right and you’ll trigger the pick me style Bonus feature. Here you’ll be taken to the Epic Hall of Tullemutt and presented with a selection of 12 runic stones. If you find a sword behind the stone, you’ll receive a cash prize. Prizes of up to 406 times your stake can be had here. The other is the Free Spins feature which is triggered by landing the golden longboat – 3, 4 or 5 of them will get you a payout of 4, 25 or 100 times your total stake as well as 10 free spins. All payouts during the feature are boosted by a 3x multiplier and trebled. Land 3 or more longboats during the feature and another 10 free spins will be added to your tally – you can retrigger multiple times with 60 free spins in total up for grabs. The only downside is that extra free spins are not subject to the 3x multiplier. 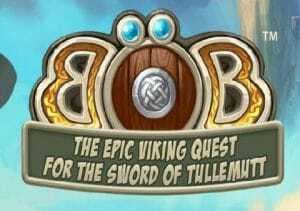 Böb: The Epic Viking Quest for the Sword of Tullemutt is a medium variance slot. There are decent opportunities in the base game but the best chances of bagging a trove of Viking treasure comes via the features. The pick me round is simple enough but the top extra is the Free Spins feature where the 3x multiplier can quickly get the coins flowing. With its quality design and impressive features, Böb is a typical NetEnt powered game. Get lucky with those features and you could be sailing away with a longboat full of loot. If the Norse/Viking theme is to your liking, WMS’ Viking Vanguard and Yggdrasil Gaming’s Vikings Go Wild are highly recommended.